Got stains? I do. I love bright colors on my family. Even before the neon trend was back in style. I liked through the 80s, 90s, all the way until now. But have you ever a favorite and you get a stain on it? Then the stain never goes away. What do you do? Keep wearing it with the stain? 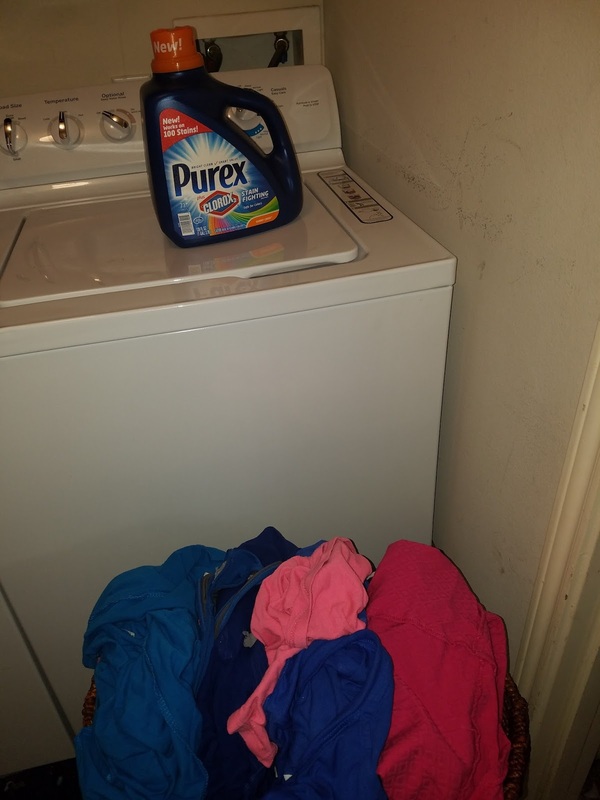 Thanks to Purex for providing me with a sample of Purex plus Clorox 2 detergent in exchange for a product review. All opinions stated are my own based on my personal experience. Two of my favorite products have come together to make a mega product. Remember that stain I told you about...well if it was on a white article of clothing I would throw some Clorox in the wash to get the stain out. What about a stain on your favorite color top/bottom? Depending on the stain I would have thrown the article of clothing away. But now, I do not have to throw my favorites out. -Protein-based stains-We suffer a lot from bloody noses and don't get me started on all the playground clothes that comes home with new grass designs that were not there before. -Starchy stains-My Lil Bit loves spaz-get-ti. It is her favorite. She can eat it everyday. She loves to eat one spaghetti noodle at a time. Slurping them means tomato sauce all over her face, plate, table, and clothes. And who doesn't love chocolate bars, s'mores, and those little M&M's? -Food stains-My son puts BBQ sauce on everything. My husband puts hot sauce on everything. And me and the little one use Ketchup on everything. Plus Summer is right around the corner which means ice scream, you scream, we all scream for ice cream! Pretreat tough stains by rubbing some Purex plus Clorox 2 detergent into the fabric and letting it sit for 5 minutes before washing. Purex plus Clorox 2 detergent is available in two fragrances: Original Fresh and Sunny Linen. Still not convinced? How about you try it yourself? Thanks to Social Insiders and Purex, you get to try it. Enter below for your chance to win a product coupon for Purex plus Clorox 2 detergent. This giveaway is open to US only. Good luck. My tip is to get to the stain before it dries. Many stains will come out with plain water if you get to them fast enough. I left a comment on the Houston arboretum post. My tip is to get it in the wash as soon as possible.